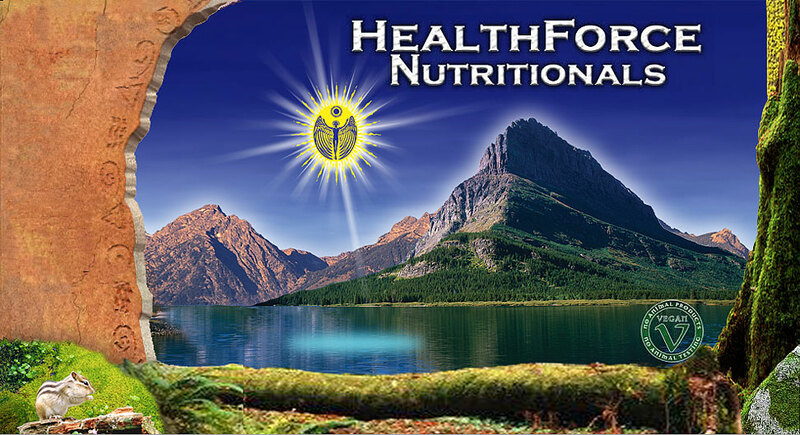 Healthforce Superfood Seminar w Bethanne tmrw at 6pm Pacific time! check out the FREE downloadable podcast HERE. yet but that link above will bring you there once Bethanne has posted it. the living foods lifestyle...its an hour long so it will fly by. 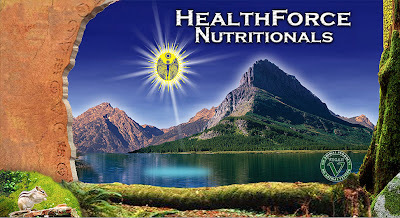 we need SOOOO many more companies like Healthforce! and she is having a big sale on there so check it out..great ebooks! This is the link to attend! See you there everyone!! Figs...in Minnesota...at the end of November. Who else is doing this????? in Phoenix and now Los Angeles...thin blood for sure. parents are still sticking it out up there! One thing for sure, it definitely weeds out the weaklings! to find lots and LOTS of people...definitely not so in Minnesota! and he even mentioned minnesota! Crazy! I filmed loads so there are more coming soon. but outside again was 0F and SOOOO windy. On the sunny days it got up to 70F - so that is paradise. block out the comfrey and Jake's goji berries. and chopped up those cherry tomatoes really well for the compost pile. My whole thing now is mushrooms growing from logs. as much energy and lack of competition as possible. or the gojis is pure blasphemy! soil instead of feeding from it...the trees agree. be able to eat it ourselves! What a concept! 16 squares filled with two kinds of cabbage, broccoli, and brussel sprouts. down to the nub...nothing left at all. hmmm.....can you feel the frustration? in Phoenix? I cant get a break here!!!! hiding our food up in the tree away from hyenas. sauerkraut and he has to fence the damn things in a veggie fema camp! blocking out the sun, sucking up water and nutrients..
the rain from getting them all blighty. causing fungus on the leaves...this is key! the scent of the doe was hard competition. Maybe he is the one nibbling on the mulberry trees! Damn! That edible fence IS NOT GROWING FAST ENOUGH!!! hahaha..
its a tough ball game for sure! No one ever said that wild animals were easy to beat. you get REALLY crafty at finding food. more to come...editing the videos now. bless youtube and the internet for getting the word out. "What in the World are They Spraying??" It has the SCIENCE! The MOTIVES, the EVIDENCE. out the entire sky as they dissipated? Not me...they would disappear right after. and that getting worried about them is "weird". found in the samples is WEIRD. No chemtrails near the Minnesota Food Forest though! Just thousands of geese flying overhead! I'll take it! remove aluminum from rats at the University of Barcelona. and will be adding malic acid. so with these three...Im crossing my fingers that it works. about chemtrails or the government poisoning us - its already in my body. EDTA, MALIC ACID, INTESTINAL DRAWING FORMULA. I still have chlorella too...we shall see. AFTER the plane hit...more explosions going off in the building. Ummm......straight from the source - no Mainstream Media Filters. What sweeteners are you digging right now anthony in your elixirs? Any thoughts on the ''raw'' coconut sugar crystals by Coconut Secret? this question came at a perfect time. 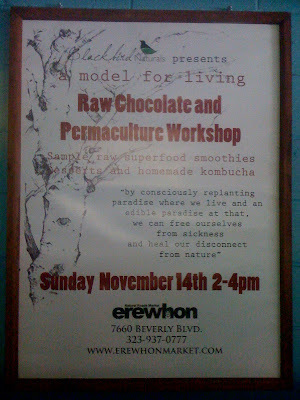 at the Venice Whole Foods and Essential Living Foods was offering it. I thought the dried version would be worth the try. with caramel! Seriously. Im loving that dried nectar WAY too much haha. or oats and some raw granola...a good breakfast without a doubt. as well as the black sage. and the dates that we got from Deb's fav farmers market this sunday. and have them the next day with raspberries...YES! DurianRider would be proud of me! One day I ate probably 20 sweet yellow guavas that were just heaven. And sapotes, persimmons, figs...its been higher than normal. There it is...always experimenting and mixing it up! I know sugar is bad but hey - I have to experiment. Where is everyone else on the sweet side? Blackbird @ Erewhon in LA this Sunday!!! am i kidding...? um yes. But boldness is rewarded! blended w/ superfoods and our very own kombucha as well! own Food Forest and WHY you should be doing it ASAP. Its a 2 hr event but come and go as you please, we'll be recording it too. 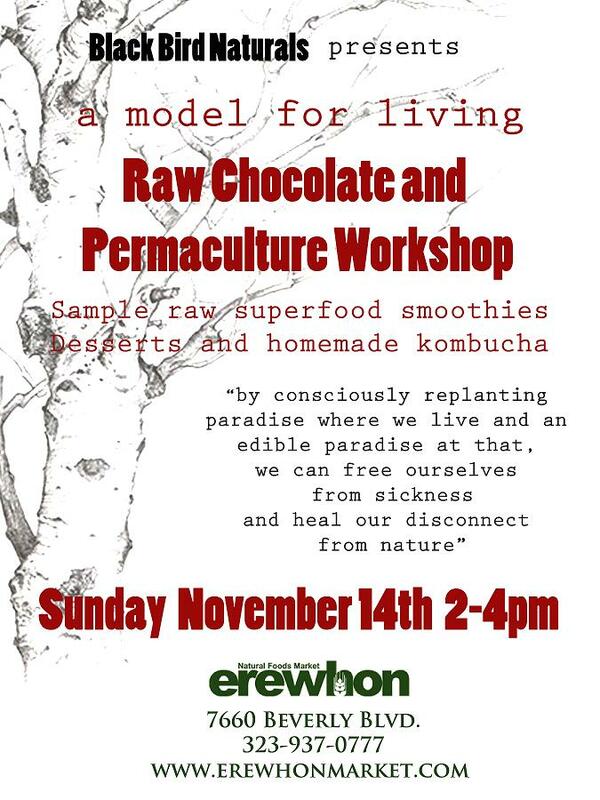 Here's the image from Erewhon's site. thought possible this early on...we are so grateful! be planted next spring will spread and spread for decades. Think about the hundreds of seeds put out by each plant..
what we plant now could very well travel on and on for a very long time. 10 years from now that originally came from a Blackbird tin in way back when in 2010. Guerilla Gardeners should have free reign to the city - for they are working for love!! Once I finally honored the Earth by taking care of her skin. and feeding it like an actual pet, my thumb suddenly became pretty green. The plants surged, and I simply loved them and treated them as the sentient beings they are. It worked. we are directly fighting the dark forces that seek to remove as much plant life from mother earth that they arent able to genetically engineer and resell to the public. Our seeds our heavy re-seeders....so get ready for abundance when the cycles come around. Spread the life...spread the overgrowth. Spread more oxygen around! Heaven knows we need as much fresh air as we can get these days! 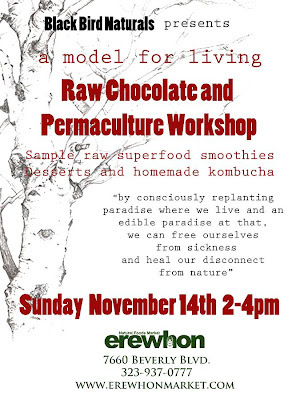 We are doing an event at Erewhon next sunday at 2pm! We will be covering all this and more!!! See you soon! and have been LOVING IT bigtime...Elixir of the Lake is GOLD!! Hello Anthony!! I had a quick question for you. Where can you buy,or where do you get your Kombucha from, and how do you make it? I'm sure I remembering you blogging about it a while back, but cannot seem to find that post. If you could let me know how you make it that would be awesome, thanks!! I make it myself now! Its great - I make 2 gallons of black tea with about 10 bags (weigh it out if you have to, always organic and just black tea for starters...) and two cups of sugar or maple syrup. So 1 gal = 5 bags and one cup of sweetness. Pour a bunch of kombucha OR put a pancake scoby inside and in about 2 weeks it should be sour. I get 2 gal glass jars from Wal-mart with the glass lid - they are awesome. I know its wal-mart and its not the coolest I guess to shop there but its the only place i know of that has the jars. going to do sarsaparilla and oolong tea! A huge thanks for your support! and truly a large part is thanks to you both. and we know that the SYNERGY will only speed things up even more! Thanks so much for the kind words too! it seriously made me blush!!! So from the bottom of our hearts - Thanks and Love!! We are all adding to the reconstruction of Heaven on Earth! Here is one of their latest videos!! LOVING the Space!!! "As many of you know, Anthony Anderson, the "Raw Model" is an EXTREMELY ethical man whose heart is all about regenerating Mother Earth. 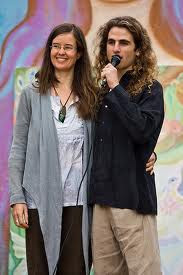 You also probably know that a big portion of his energy goes into growing his own wild foods in the most eco-friendly, organic way possible. The concept of these new Wildharvested Superfood Seeds from Anthony is BRILLIANT!. We received the seeds into our store a week ago, I haven't even talked about them yet, and they are already FLYING off the shelves! 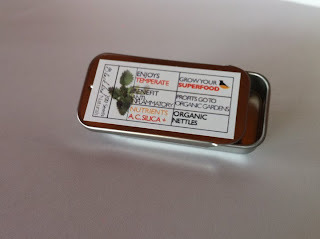 These Wildharvested Superfood Seeds come in these beautiful miniature sliding-door metal containers, to protect them. The packaging is very attractive and makes aGREAT gift idea. In fact, Anthony even created a gift pack containing one of each of the THIRTEEN Superfood Seed packs, as you can see in the picture to the left. He also created two specialist 3-packs, which you can see in the list below. Not only are these the HIGHEST quality of seeds... BUT!!!... Anthony did all the work for us in selecting what he feels to be the TOP 13 Superfoods that we can be intaking into our bodies in order to establish a strong immune system and health! I am excited about ALL of these new Wildharvested Superfood Seeds... However, I am dumbfounded by the fact that from this little $3.95 miniature tin of Goji Berry Seeds, you could LITERALLY grow over 1000 Goji Berry plants and create yourOWN Goji Berry Forest!!! " Thanks so much you two!! Keep spreading the LIGHT!!!!!! A really strong site for harvesting wild edibles is FeralKevin. and learned quite a bit from his work. in their own back yard too...MAKES PERFECT SENSE. Here's a great vid from him...def subscribe and enjoy. Just loved this one - the ideas are sppppreaaaaading. Hey Anthony, this is a very interesting concept. and I totally agree on the concept that city planning is really bad for many reasons. sometimes for a slavery type of salary! We have to go back to our roots, and start making money in the form of food! The food we grow is money we save! And food we prepare is money we save as well! Everybody should have a garden, bigger or smaller, but everybody should have one! and we will enrich the soil of this precious Earth we live in, and naturally clean and purify the water we drink. Anyways, I could go on and on on this...but it's your blog my mate!